The NX-8100 Series is the first CNSL-based waterborne curing agent product line available in the market. Phenalkamine grade NX-8101 is designed for cost effective water-based metal primers that require high corrosion protection and concrete epoxy primers and self-levelers that require quick return-to-service, and excellent adhesion to concrete and top coats. Phenalkamines are highly hydrophobic due to the long aliphatic side chain present in cardanol, which results in excellent corrosion and water resistance. However, that also makes it very challenging to synthesize cardanol-based materials that are stable in water. Through proprietary technology, Cardolite Corporation developed NX-8101, the first phenalkamine supplied in water that does not contain solvent or glycols, and does not require the use of additional emulsifiers to work well in epoxy systems. 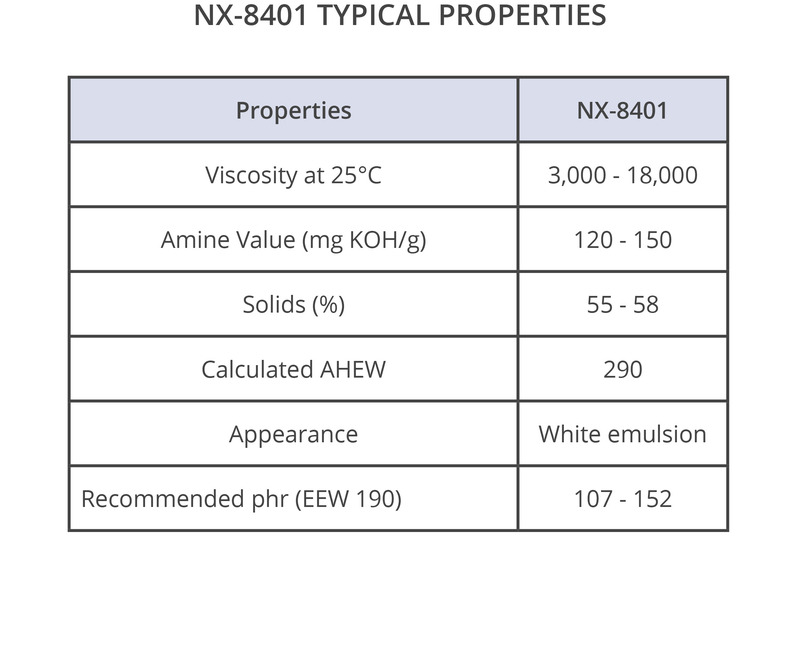 NX-8401 is a new, completely free of solvent, low viscosity and easily reducible with water curing agent for the formulation of zero and very low V.O.C. coatings. The excellent compatibility of NX-8401 with various epoxy dispersions and its ability to easily disperse pigments and fillers give coatings scientists wide latitude to formulate high performance waterborne epoxy coatings. NX-8401 was specially designed for anticorrosion coatings applications that require long lasting substrate protection. Coatings based on NX-8401 provide superior corrosion protection even at thin film thickness with excellent adhesion to various types substrates such as blasted and cold rolled steel, galvanized steel, aluminum, and concrete. These coatings can be quickly recoated with typical topcoat technologies such as acrylics and polyurethanes in room temperature or baked cure applications. The development of good anticorrosion properties after short cure cycles enables fast productivity and cost savings. Moreover, the fast recoatability does not come at the price of workability. On the contrary, coatings based on NX-8401 are of long pot life regardless of the epoxy dispersion used lowering risks of failure in the field. Additional benefits of NX-8401 include increased flexibility and improved color retention for formulators considering epoxy coatings as an option for topcoats. Even tough NX-8101 is high in viscosity, it can be easily reduced to very low viscosities with the addition of water once mixed with an epoxy resin. 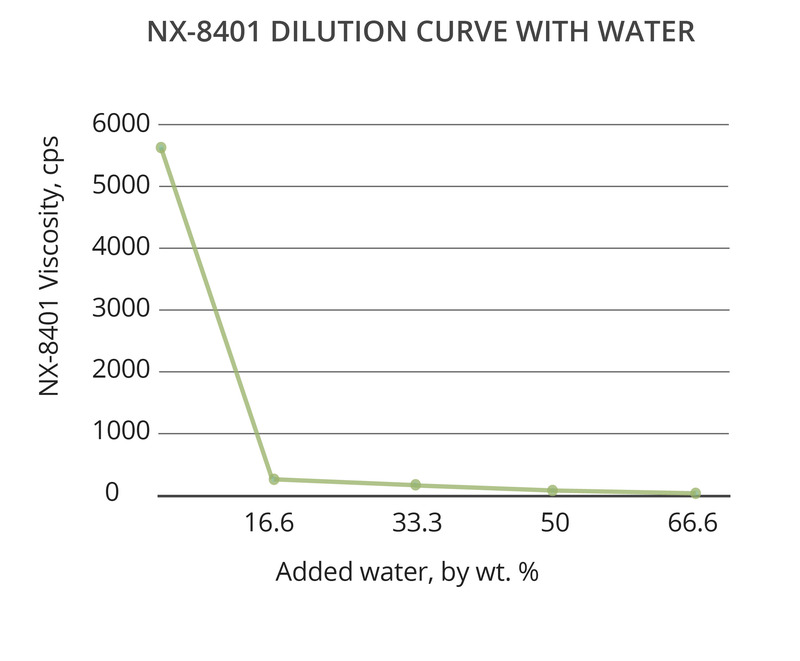 NX-8401 can be easily diluted with water by itself or after the addition of an epoxy dispersion. 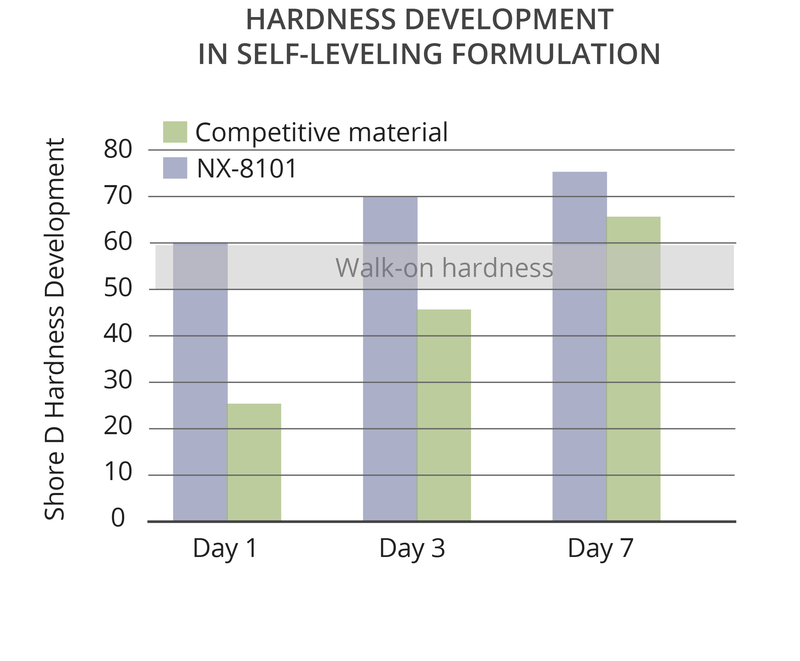 NX-8101 provides very fast hardness development at room temperature and at lower temperature and higher humidity (10°C/80%RH), which are properties inherited from CNSL technology. 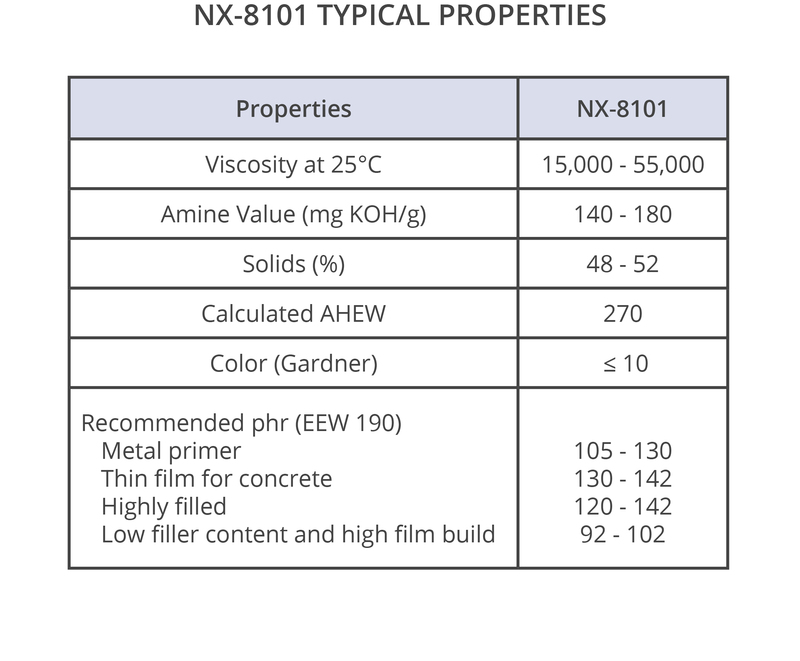 Furthermore, NX-8101 also maintained the excellent corrosion performance of solvent-borne phenalkamine counterparts. 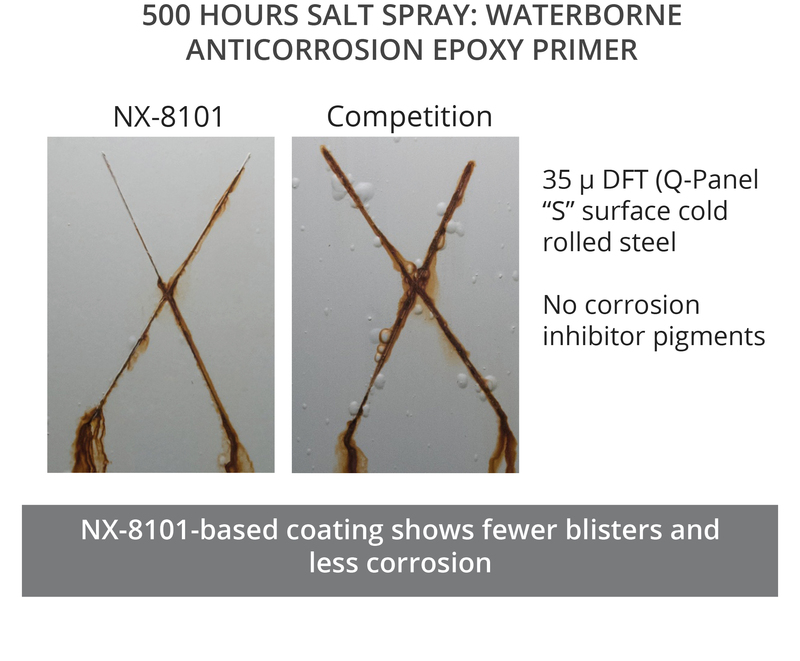 The hydrophobicity and adhesion and wetting properties of NX-8101 lead to long-term corrosion protection as demonstrated by salt spray performance. However, different from many competitive materials, NX-8101 also delivers early corrosion resistance due to the fast cure and consequently, sufficient crosslinking shortly after application as shown by results after a 16-hour cure at 25°C followed by immersion in 50°C tap water for 48 hours. NX-8101-based epoxy clear coats provided good corrosion performance after a 16-hour cure showing no blisters and similar performance to the same system immersed after a 5-day cure.